Last summer I purchased the Garmin Oregon 450 GPS as a replacement for my aging Garmin Summit GPS, I am pleased to say the least. It was fortuitous that I made the swap when I did because unbeknown to me my Summit was cracked. My Garmin Oregon – this picture is taken in direct sunlight. Easy to see graphics. I had planned to give it to a friend, but when I went to change the batteries I found the crack. It goes all the way across the battery storage compartment. Although the Summit remains working I can no longer rely on its performance because it may fail if water were to get inside. For moose hunting I have used a GPS for years, the Garmin Summit has served me well (about 10 years) and never failed me. Unfortunately the model I owned did not support mapping software, as a matter of fact in those early days, mapping GPS's were either too non-existent or expensive. My old Garmin Summit was a good unit. I used it to get out of the forest, to locate camp, return to waypoints and measure distances to... whatever. I used it in conjunction with topographical maps in the UTM mode. UTM stands for Universal Transverse Mercator, a projection used in mapping. It has a built in compass and barometric barometer, all features available in the newer Oregon series. Using UTM we were able to take measurements in meters directly from our maps and plot distances to go as well as future waypoints. This method was cumbersome compared to using the USA mapping software on the Oregon GPS. As the years progressed so too did technology in the GPS mapping capabilities. I did my research and decided on the Garmin Oregon 450. I chose the Oregon 450 over the Garmin Oregon 550 because I already carry at least one camera with me (with much higher resolution) I could not justify the extra cost. You may wonder why I did not get the T-model. The T means the GPS comes pre-loaded with maps. The Garmin Oregon 450 was on sale at a local business for much lower than I could get it anywhere else. The Canadian topographical mapping option was not available at the time. I have since purchased an 8GB micro card and installed the Canadian topographic maps. Research... believe me, I looked at any number of GPS handheld units before I settled on the Garmin Oregon 450. Once the decision was made and the purchase complete, it was time to try it out. You have to spend a little time to familiar yourself with any new electronics but I found the navigation fairly easy to get through. My issue came when it was time to use the maps. 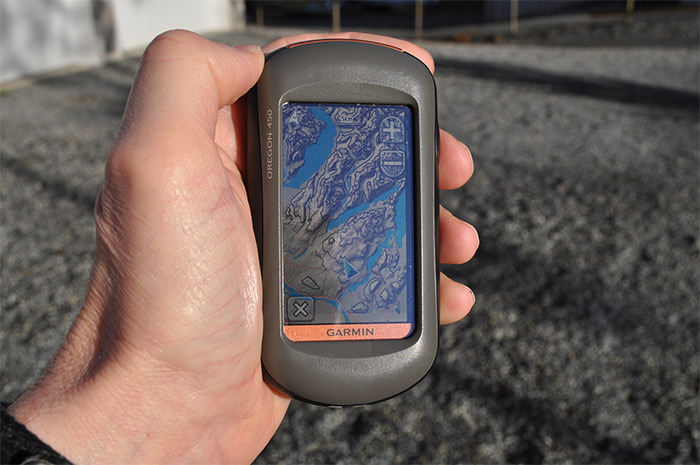 When you buy the Garmin Oregon 450 it comes loaded with the world base map, a very generic map without much detail. I needed to load Canadian Topographical maps. No problem, a simple download and a quick install. I also decided that because of our proximity to United States that a download for detailed street maps would be of benefit also. Have uploaded both of these maps to my unit I set out to use it. After enabling the world base-map, the detailed street map and the Canadian topographic maps, I was set. I was to put the Garmin Oregon 450 through its paces a moose camp in a couple of days. Iwas going moose hunting for 14 days and would soon see how good this new GPS was. I was really looking forward to using the Garmin Oregon 450. Wow, was I disappointed. The map quality was very poor, the detail and contours barely legible. I was less than impressed. Once I arrived at moose camp, where, I was hoping this handheld GPS was really going to shine I had a chance to see my partners Garmin CSX60. What an awesome GPS he had. Map clarity, detail and contours so much better than the Garmin 450. How can this be? After several days of comparing features I was convinced the Garmin Oregon 450 was an inferior unit. The moment I returned home my plan was to return it. One sunny afternoon, I was glassing a hillside for moose. There were none to be seen and I was a little bored, I pulled out my GPS for another look. I figured just maybe I was missing a configuration setting or had one wrong. I stumbled on the solution quite by accident. I had been changing this and swapping that, flipping through screens, looking over each setting trying to find the issue. Upon returning to the main screen, my eyes almost popped out of my head. Look at the detail, I had found the setting to get the map software working. But where was it? To make a long story short, I found the settings in the setup menu (the little wrench icon). Follow this path to make corrections: Setup | Map | Map Information Select Map | Make sure you only have your Topographical and World Wide Base maps enabled. You cannot have more than one map enabled at the same time. Otherwise there is some sort of conflict and then the geographical display is very poor. In other words once I disable the detailed street map and had only the topographical map enabled, it worked fine. Editor's Note: After updating the Garmin Oregon software all maps were enabled again by default. You must return to the setup and make your changes again. Needless to say I still own this device, and I really love it. I would highly recommend this product to anyone that is searching for a GPS for hunting.